Before I started climbing, life was fairly dormant. Than like a magical wand it opened my eyes to see what kind of world it pointed to. Resistance was impossible. The climbing tick attached itself firmly to my scalp just like they do at Skaha. Over the course of the short time that is 5 years my WHOLE universe revolves around that bug. Every choice I make, every thought and every day is comprised with at least a little thought toward climbing. Compromise between life paths and climbing is never made. Climbing HAS to be an everyday option or I don't do it. Travel plans revolve around it, meal plans, sleep paterns, financial moves, social gathering, physical moves, daily training, goal setting , friends, this blog. And yet, climbing, in and of itself is TOTALLY useless. 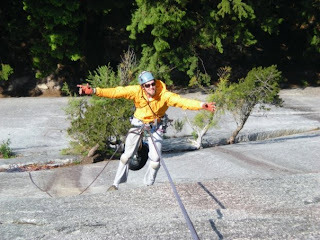 There is no practical application for climbing outside of climbing. It's a process with no end. But the discipline causes very positive changes that wouldn't have happened should climbing not have appeared... Obsessed? Probably. Delusional? Not a chance. What would life be like without climbing? There is only a few things that I think about on a hourly basis; climbing being one of them. If I wasn't able to climb or there wasn't any rock to climb, I'm not sure if it would be much differant. The reason is because we live in an amazing part of the world, with so much other fun extreme sports available. I would take up river kayaking, hang gliding, base jumping and if at the coast clam digging. To be honest though it would be very sad if there was no such thing as rock climbing. So with that sad, I would like to say, "thank you Lord for the vertical world and the oportunity we have to explore." Good thought-provoking words Jordan, thanks for posting. I guess the same could be said for any sport, be it hockey, waterpolo or golf. They have "no practical application," but I'm not sure if they can be viewed that way. Each likely brings many of things you've mentioned to their participants or fans, and that raison d'etre that we're all looking for. And the benefits you've mentioned are the just the direct consequences, there are many other links you'll make as your climbing career evolves; over the years I've equally benefitted and applied many learned skills from climbing to my work and home life such as risk management, trust, empowerment, coaching, mentoring, the list goes on. Absolutely not "delusional" and great conversations to continue having. I find it to be very honest and meaningful when I read a statement like this. So many people are without that kind of spark, passion, dedication. I believe that passion is a gift in our lifes, and that if you are strongly pulled to climbing it will be your guide. You're amazing and you inspire me!